As I write this in the library, I suddenly hear the dreaded tones of the librarian’s bell begin to echo through the various floors of the Ussher. I wonder, has my time come? Do I need to start hiding my books? Thankfully, it turns out that the bell is only meant for Ussher 1, so I’m safe. I’ll survive another few hours – but when that bell tolls, I’ll need to be ready. I’ve lost count of the amount of evenings I’ve been thwarted by Trinity library’s mysterious systems of locking certain doors, restricting access to books, and even taking books from my desk as I use them. I’m nearing the end of my third year in Trinity, and I think I’ve just about figured out how the Byzantine library system works. As students, we take the system for granted – in a twisted, masochistic way, maybe some people even enjoy it, considering the freezing cold queues outside the back door to Ussher 1 as “part of the experience”. As Sophister students in Trinity, too many of us fall victim to a form of Stockholm syndrome in relation to the failures of the library. We form a psychological allegiance with our captors, because we have to survive. This allegiance to the library that we feel is a coping mechanism; as Strentz states, “the victim’s need to survive is stronger than his impulse to hate the person who has created the dilemma”. Once you become accustomed to them, it’s easy to ignore the blatant flaws in Trinity’s library system. We experience “blurred memory” – another symptom of Stockholm syndrome, in which victims wilfully misremember events, and refuse to accept the actuality of what’s happening to them. We forget that when we first started using the library, it was a deeply confusing and mysterious experience. I recall the rumour in first year about the alleged existence of a “twenty-four-hour library” that no-one knew the location of. This was followed by countless confusing evenings being herded up and down stairs, encountering locked doors, and most frustratingly, being faced by an overwhelming lack of communication about what the “rules” of the convoluted system were. Stockholm syndrome aside, it’s undeniable that as students we are too accepting of the flaws within the library system. The issues are not the fault of the librarians individually – in fact, the library staff are some of the nicest, most hardworking staff on campus. It’s abundantly clear that the problems with the library are a systemic issue, painfully symptomatic of Trinity’s flawed systems in general. It takes visiting another university library to understand the extent to which we are having the wool pulled over our eyes in College. 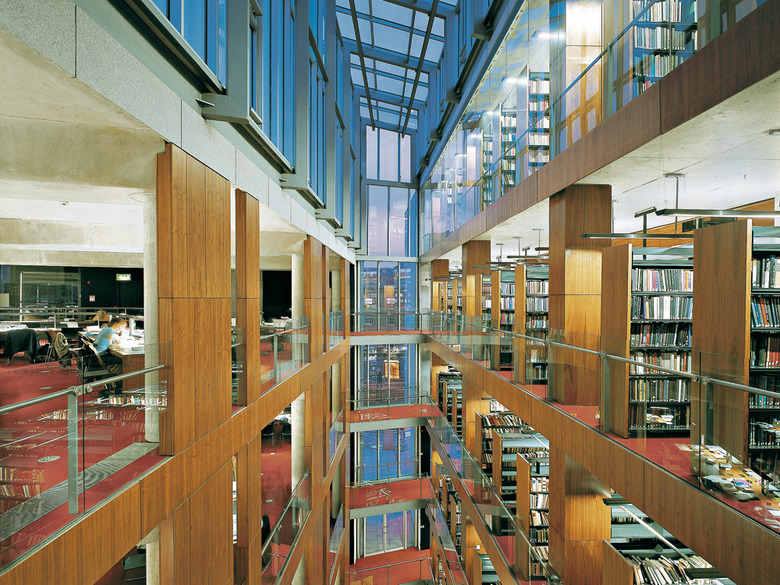 On Erasmus, I used a five-floor library almost identical to Trinity’s. The difference was that at 7.45pm, instead of a confusing mass exodus, a simple announcement went out on the intercom. “A reminder that from now on, students will need their student cards to re-enter the library.” I looked around me in shock, while no-one moved, no doors were locked or unlocked, and no-one came to try and take my books. In fact, all the bookshelves in the library remain accessible twenty-four hours a day. The library also has toilets on every floor, and even a coffee machine. Can you imagine? As students, we shouldn’t have to put up with flawed systems simply because “that’s the way things are”. It should not be necessary to traipse up and down stairs and be locked out of certain areas at arbitrary times. It’s an incredibly frustrating experience to be in the middle of writing an essay, only to find that all the books that you need have been locked away for the night. Often, because of Trinity’s archaic permissions system, the books you need are books that you’re not even permitted to take out of the library. Paradoxically, you’re not allowed to take out these certain books – but if you stay in the library to try and use them, they’re locked away and made inaccessible to you after a certain time. Allegedly, one of the reasons that the bizarre locking and unlocking of doors system exists is in order to try and catch students taking books out that they have not checked out. In classic Trinity fashion, the systemic response to an issue is to “solve” it with an even more convoluted and counterproductive solution. It’s a vicious cycle; the more difficult and restricted that Trinity make the system of taking out books, the more that students who need the books are forced to try and sneak them out. The result is that students and staff are subjected to a woeful library system from which nobody comes away happy from. The “user interface” of the library is unnecessarily complicated, and it becomes incredibly tiring to have to go through a bizarre nightly charade of being herded outside the Ussher, being forced to wait, and then eventually being let back in. I won’t even get started on the toilet situation. As students, we don’t expect everything to be handed to us on a platter, but the current library system fails to even meet to most basic adequate of students’ needs. There are dozens of potential solutions to the issues faced in the library, but it must be acknowledged that the current haphazard system serves only to cause more difficulties. It could be as simple as keeping the Berkeley entrance open and staffing it overnight – this is how it works in other 24 hour university libraries, and there are already security staff who work night shifts on campus. We pay more than enough to go to Trinity each year – considering College is spending over €170,000 on wine over the next two years, there is absolutely enough funding to solve this issue. The problems with Trinity’s library system are endemic of a wider apathetic attitude to students held by College. On a good day, it could be described as wilful ignorance – the mishandling of TEP, Erasmus grants, and the “classic” systemic administrative issues are all examples of this. These issues would almost be funny, if it wasn’t so genuinely appalling to experience them first-hand. Then, on a bad day, we’ve seen how Trinity actively plans ways to exploit students for profit, with absolute disregard for student wellbeing in the process. Last year’s supplemental fees provide the clearest example of this. As students, we shouldn’t be content to just sit back and put up with the perpetual systemic flaws that we face on campus. This is not Stockholm, and we are not in captivity. It’s time to demand better solutions, and the library is a good example of where to start.